This recipe came about from following my meal plans! The plan had included my classic insanely simple Chicken & Peppers, but I wanted to do something different and a bit quicker. And so sausages it was! I’ve fancied it up a little by serving with basil and crumbled feta. But the cooked peppers are really still the star of the show. Love their sweetness in contrast to the salty tangy feta. 1. Turn your oven on to 250C (480F). Place peppers in a medium baking tray. Remove sausage casings and pinch meatball sized chunks of sausage meat onto the peppers. Add a little salt and drizzle with oil. 2. Bake for 15 minutes – no need to wait for oven to preheat before cooking. 3. Stir and bake for another 5-10 minutes or until the sausage balls are cooked through and the peppers are tender. 4. Add vinegar and stir in to season the sausage and peppers. Taste and season with salt and more vinegar if needed. Remeber the feta is going to add a good dose of salt. 5. 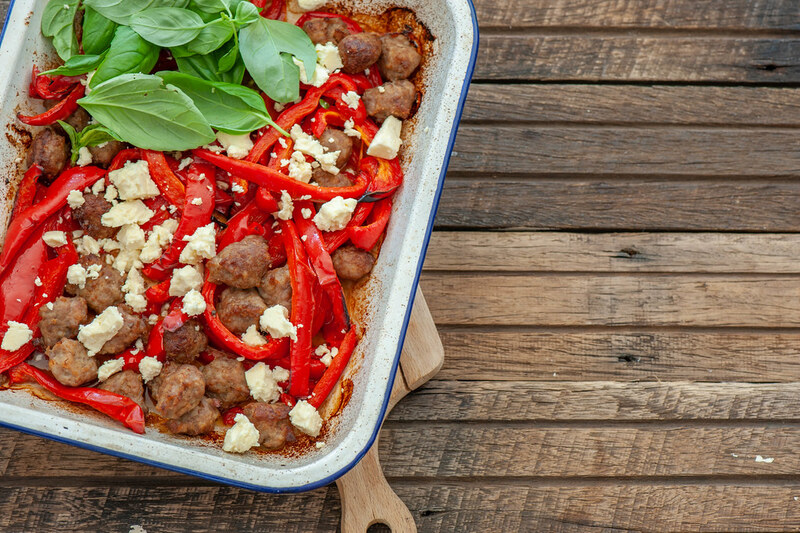 Divide sausages and peppers between two plates or bowls and top with feta and basil. Serve salad or veg on the side. WINE MATCH: A nice savoury tempranillo or shiraz. 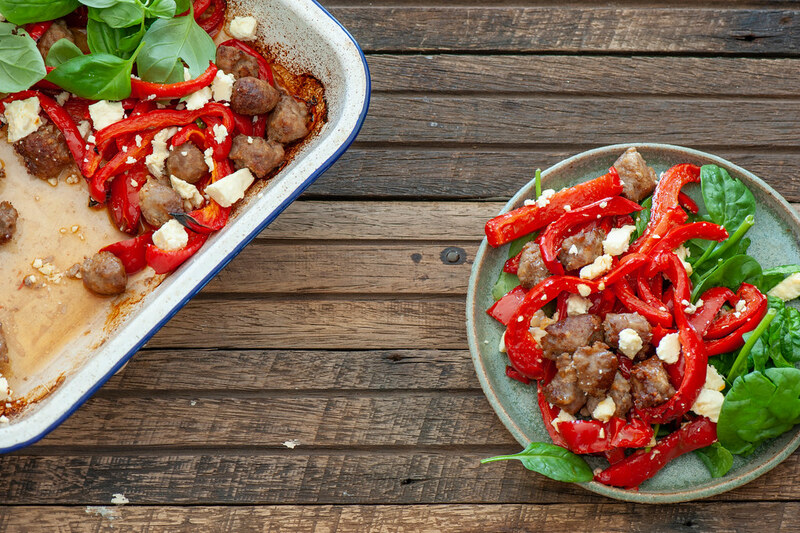 short on time – Pan fry the sausages and peppers until tender. vegetarian – cooked chickpeas or beans. Or serve the cooked peppers, feta and basil with an omelette. vegan – use cooked chickpeas or beans instead of the sausages. And replace feta with smoked salted almonds or olives. dairy-free – replace feta with smoked salted almonds or olives. more substantial (carb lovers) – cooked pasta, potatoes or pita bread. more substantial (low carb) – more sausages or roast nuts like almonds, walnuts, cashews or macadamias. Or serve with a big dollop of mayo. different flavours – use spicy sausages such as chorizo or other flavoured sausages such as pork and fennel. more veg / different veg – add sliced zucchini, diced eggplant or sliced mushrooms with the peppers. Finely sliced onion would work too. different herbs – flat leaf parsley, oregano or mint. red bell peppers (capsicum) – keep in the fridge for a few weeks. For longer grill and store in an airtight jar under oil. Or freeze them. sherry or red wine vinegar – keep it in the pantry. feta – keeps for months unopened in its packet. Or can be frozen. Or you could make a marinated feta by putting it in a super clean jar from the dishwasher and covering with oil and then keeping it in the fridge. Sometimes I like to add flavouring like bay leaves, lemon zest and pepper corns or chilli. Yes! Just cook as per the recipe but keep the feta, basil and salad / greens separately. Leftovers will keep in the fridge for 2 weeks or can be frozen. To serve, warm in the oven 200C (400F) for 10 minutes or until hot.